Discussion in 'Accessories' started by adelorenzo, Dec 3, 2011. I've been meaning to get a proper camera strap, but after bouncing my GF2 off a tile floor today I figured it was high time. 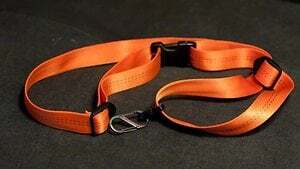 I've been looking at straps like the sun sniper or black rapid but they are not cheap. I figured I could rig something up myself, and this is the result of a few minutes work and about $15 invested. The strap is tubular nylon webbing (used for climbing) and some plastic buckles from the local outdoor store. I attach the camera using a gun swivel, small carabiner and some split rings. I plan to play with some different attachment systems (perhaps a tripod mount) and some kind of shoulder pad or stabilizer, but for now this works just fine. That looks great. I've been using the factory strap for my GF1 and it's driving me crazy. I'm going to REI and show them these pics and see if I can't make one just like it. Thanks! Nice..I could use one of those. Don't suppose you have any names/brands for recommended components? Nylon webbing, buckles, carabiners would be commonly available at outdoor shops. In the US somewhere like REI. The gun swivel (they go on the end of rifle slings) would be found at Cabelas or any store like that. In my case (Canada) is was the local outdoor sports store and Canadian Tire for the gun swivel. In fact, just looking at the REI site they are a gold mine for this kind of stuff. They have all the bulk webbing, but you could even use these pre-made straps and then just clip a carabiner on there, although the nice thing about the rifle swivel is that it always stays flat on the webbing. These keychains look like a good quick release attachment for the camera. See post #21 for a list of component suppliers and post #47 for my variation on the rifle sling theme. I would be wary of trusting my camera and lens to something designed for the weight of a few keys. The gun swivel (they go on the end of rifle slings) would be found at Cabelas or any store like that. Many more options, including the quick release swivels that I use, at World's Largest Supplier of Gun Parts, Gunsmith Tools & Shooting Accessories - Brownells. I have found that an unpadded 1" strap alone works fine for the weight of my G1 even with heavier lenses like the 100-300. Try this idea: https://www.mu-43.com/f67/simple-diy-camera-belt-clip-14598/ When the camera is in the clip I am not even aware that I am carrying it. Is that your GF-2 in the black with red trim? Looks snazzy! Thanks for the links, those threads have some great info for my tinkering. I'm already on to version two and now thinking about version three. Thanks! It's a red GF2, I added some kind of leatherette covering for the front. Thanks for the post - just what I need. I've been wanting an inexpensive sling style strap! Yours looks nice! I'm already on to version two and now thinking about version three. Yes, playing with this stuff is fun! Take a hard look at the pushbutton release sling swivels for your V3. I just got back from a 3 week trip to Africa with two G1 bodies and I found myself frequently switching straps. Typically, one body was on the sling and one on the conventional strap, but the wrist strap saw duty too. It's also handy to ditch the straps completely when putting the camera on a tripod. With the pushbutton swivel the camera connection is extremely secure but can be released in one or two seconds. Three if you're slow.